We’ve all experienced a miracle in life at some point or another. The question is can you identify them? As Christians, we believe in miracles. In fact, many of us make them happen for others. 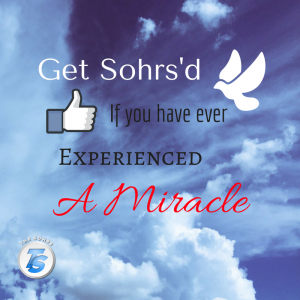 In this week’s Get Sohrs’d focus, we’re sharing our miracles with the world. What miracles have you experienced? What miracles have you been an instrument in others experiencing? [Share] or [Like] our social media posts (on Facebook, Twitter & Google+), if you’ve experienced a miracle. It’s your time to show the world what you, Christians, do.